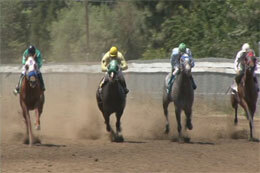 Grants Pass hosted for trials for the Firecracker Futurity on Sunday. GRANTS PASS, OR�JUNE 19, 2016�Making just her second start after a trouble trip in Pot O'Gold Futurity trials, Gabanelli posted a 1�-length winning effort on Sunday to set the fastest time for the Grants Pass Firecracker Futurity. The eight fastest qualifiers, from four trial races, will return to the Oregon raceway on Monday the Fourth of July to vie for the winner's share of an estimated purse of $14,000. Gabbanelli was the first of five finalists saddled by leading Northwest trainer Hector Magallanes. Ridden by jockey Eduardo Gutierrez-Sosa, the daughter of multiple stakes sire IVORY JAMES completed the 300 yards in :19.997 seconds, a 91 speed index, to earn the top qualifying spot. Jorge Hernandez owns the Oklahoma-bred filly from the Mr Eye Opener mare Eye Love It. Jose Acosta bred the $6,500 Heritage Place September Yearling Sale graduate. For the complete list of qualifiers to the Grants Pass Firecracker Futurity, including times, sires, dams, owners, breeders and trainers CLICK HERE.